Jackie has her Doctorate in Physical Therapy (DPT) and is a Certified Group Fitness Instructor (CPT) through the American College of Sports Medicine (ACSM). 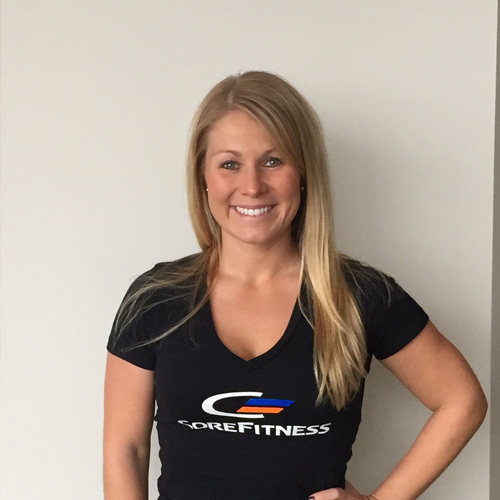 She currently works full-time at Temple University Hospital, but fitness is her second love! She fell in love with teaching fitness at Penn State University and has been striving to make others love fitness as much as she does for the past 8 years. She has raced in the Broad Street Run for the past 6 years as well as numerous 5ks, 10ks, and half-marathons. Marathon is on the list! She began as a participant in Core Fitness classes and fell in love with the company’s mission, standards, and awesome participants that she wanted to be apart of such a great team! You can bet her competitive and energetic personality will bring some high intensity pushes in each of her classes, but don’t worry, there are always modifications if needed! She is short, but fierce, and ready to push you to the next level to get the fitness and lifestyle change results you want. After all, she believes being fit is a lifestyle, not just a hobby! Her motto: move a little every day! She believes any form of physical activity each day is the key to a happy and healthy life.